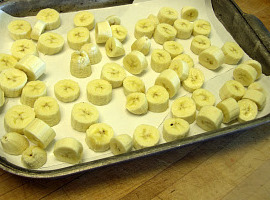 Broiled bananas for desert. Slice down the middle and sprinkle with brown sugar. Broil for 2-3 minutes until a slight crust forms. Take the bananas out of the over and add a little cinnamon. Enjoy! Oops, I meant to say dessert! Mmmm...that looks so yummy! We made banana bread yesterday and loved it. I suppose there's always banana splits, but it's more of a dessert!